"At nine o'clock in the morning on July 29, 1903, a district of a few acres in the town of Tewksbury [Massachusetts], just south of Lowell, went about its usual workday routine. The day was fair and moderately warm. In the bend of the Concord River, which sweeps by this bit of low land on the north and west, five boys were swimming. To the east and south were some scores of small houses from which the men had gone out to work, leaving them mainly occupied by women and children. Two buildings stood on the swampy land in the bend of the river; single-story brick structures, both without windows. Several men had been busy for some minutes bringing boxes out of one of these buildings and piling them on a wagon, while a woman standing near watched them. On the other side of the river, a train was just pulling out of the station. At six minutes past nine, a man ran out of the small brick building, followed by a little thread of smoke. Then came a deafening roar, followed by a long roll like that of a thunder clap. Passengers in the train across the river saw a huge cloud of dust rise from the swampy ground. 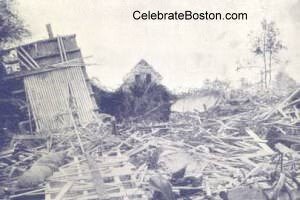 In the same instant a score of the small houses were flattened into heaps of tangled boards and timbers on the ground. Twenty persons, including four of the five boys splashing in the river, were killed outright, or so badly injured that they died soon after. And while the people on the train saw this magical transformation, buildings were shaken and windows broken in hundreds of places within a radius of fifteen miles. People as far away as Dedham to the south, and mid-New Hampshire towns to the north, felt the shock. From the heaps of mangled rubbish that bordered the area of swampy ground in the Concord River bend, the dust of broken plaster rose into the air, together with smoke and flame and the cries of wounded and frightened human beings. This sudden and terrible change of scene was the work of about one thousand pounds of dynamite and a large but unknown quantity of powder, which later contributed the roll in the roar of the explosion. What caused the explosion is unknown. It occurred in a magazine jointly occupied by the United States Cartridge Company, whose factory was in Lowell, and the American Powder Company, in which the latter had dynamite stored. Some two weeks before the disaster, officers at the Cartridge Company found that nitro-glycerin had leaked on the floor from the boxes of dynamite. The Powder Company was notified, and arrangements were made for the removal of the explosives from the building, while the old floor was being washed with caustic potash and a new floor laid over it. The workmen of the Cartridge Company had removed part of the powder, and it stood piled on a wagon nearby when the magazine blew up. It seems probable that the trouble started in the Cartridge Company's side of the magazine, which was separated from the stored dynamite by a partition which did not extend down to the floor. An explosion here would have detonated the dynamite. The powder loaded on the wagon apparently exploded from the first shock, and then the explosion of the second magazine, which was leased by the Dupont Powder Company, must have followed almost instantaneously. The ruin caused by the accident was appalling in its perfection. Hardly a scrap of material was left of either magazine. The tearing of the explosive gases hollowed out great cavities where the buildings had stood, and these slowly filled with water from the wet soil nearby. Some of the ruined dwelling-houses were mere heaps of rubbish; many were only partly demolished, while still others suffered chiefly by the falling of plaster, breaking of glass and the displacement of furniture; some were set ablaze by stoves that were overturned by the blast. In Lowell, the noise of the explosion and the wild reports of frightened people running through the streets caused almost a panic. Thousands hurried to the stricken district, a few being cool enough to begin the work of rescuing those imprisoned in the ruins. Physicians hurried out from the city, and as fast as the wounded were rescued, they were sent to St. John's Hospital in all sorts of improvised ambulances. Lowell will not forget the horrors of that work of rescue, and the gruesome task of searching for traces of those whose bodies had utterly disappeared. Three acres of ground were entirely laid waste; the trees and bushes in a considerable radius being torn and blasted as by a breath from a huge furnace. The moist ground was trampled into mud under the feet of the crowds of spectators and rescuers. Men, women, and children, badly frightened, as they had good cause to be, ran about, searching for friends and neighbors. Some of the dead bodies dug out of the ruins were frightfully mangled, while the sufferings of the more seriously injured were hardly less affecting. Of the scores who were not so severely hurt, many looked like scarecrows from bruises, grime and torn clothing. The region of the explosion was at once put under a military guard, and for five days after, it was the focus for crowds of sightseers who watched owners and tenants as they searched the ruins of their houses. Besides these, officers of the state and Lowell police were making a careful search of the whole area for clues to those who could not be found. And ghastly traces they came upon—an eye, a hand, a shoulder blade—were among the dreadful relics gathered. The river bed was dragged, and the hollows made on the sites of the magazines were pumped clear of water. Every bit of clothing, every button, was saved for the scrutiny of those who sought missing friends; every bit of flesh and bone was laid before the doctors, who tried to decide which might be animal and which human, and not until every particle had been picked up and passed upon, was the guard of militiamen removed. In comparison with the heavy loss of life, the destruction of property was trivial, not exceeding $100,000, within the direct field of the explosion. The ruined and damaged houses were mostly occupied by French mill people, and the destruction of their property was also completely devastating. Speedy steps were taken to help the sufferers; nearly $10,000 in cash was contributed within a few days, and it was pleasant to record that the crowd of sightseers who swarmed to the ruins on the following Sunday gave about $1000 of this amount."